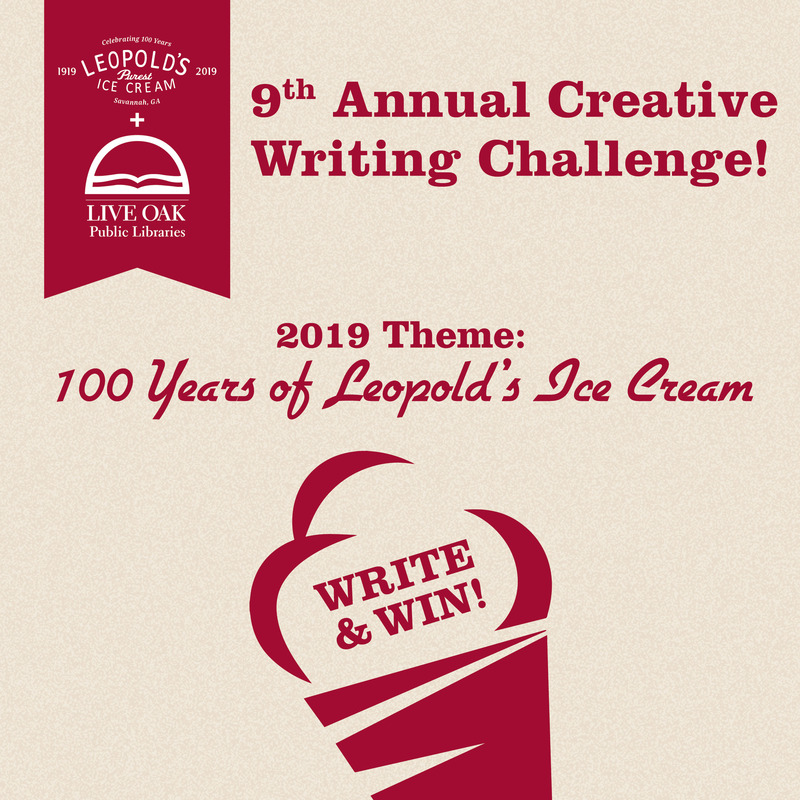 Leopold's Ice Cream / Scrapbook / From our team / Leopold’s Ice Cream Announces The 9th Annual Creative Writing Challenge! THE 9th ANNUAL LEOPOLD’S ICE CREAM CREATIVE WRITING CHALLENGE IS UNDERWAY! 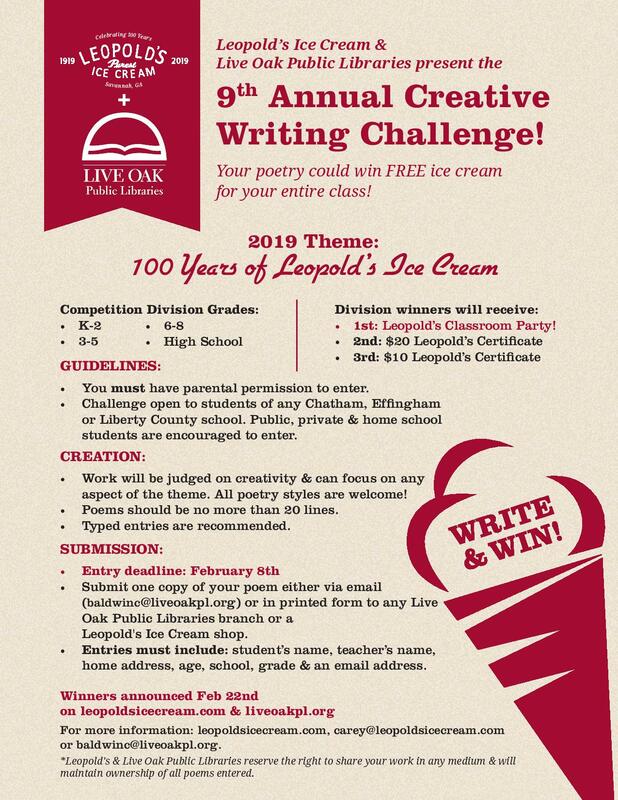 Leopold’s Ice Cream and Live Oak Public Libraries have partnered once again to host the 9th Annual Leopold’s Ice Cream Creative Writing Challenge. As Leopold’s Ice Cream prepares to celebrate a century of ice cream in Savannah during 2019, students are encouraged to creatively express their thoughts on this year’s theme, “100 Years of Leopold’s Ice Cream!”, through poetry. One finalist from each of the four age groups (K-2, 3-5, 6-8 & High School) will win a Leopold’s Ice Cream party for their classroom! The contest opens today, January 18th, and runs through Friday, February 8th when all poetry is due via email (baldwinc@liveoakpl.org) or physical submission at a Live Oak Public Libraries branch or a Leopold’s Ice Cream shop. The challenge is open to all students (public, private and homeschool) in Chatham, Effingham and Liberty Counties. Winners will be announced on or about February 22nd on the sponsors’ websites. Full contest rules and informational flyer can be found here. Stratton & Mary Leopold, longtime advocates of literacy and fostering creative energy in our youth, have hosted this annual competition since 2011. The contest has proven to be a huge success with hundreds of entries each year. Leopold’s Ice Cream was founded one hundred years ago in Savannah, Georgia by three brothers from Greece. Peter, Basil and George passed their tradition of making super-premium ice cream, one batch at a time, down to Peter’s youngest son, Stratton. Stratton and his wife Mary own and operate Leopold’s Ice Cream today. Their commitment to arts and education in the community is second only to their commitment to creating the highest quality ice cream possible in a fun, family environment. Live Oak Public Libraries is a system of 16 libraries and one bookmobile providing programs and services in Chatham, Effingham, & Liberty Counties. Their mission is to provide excellent, responsive service to enrich people’s lives, support lifelong learning and build and enhance their communities. « Leopold’s Ice Cream announces the winners of the 2019 Creative Writing Challenge!